More typically, Phinney’s best results have come in the time trials. 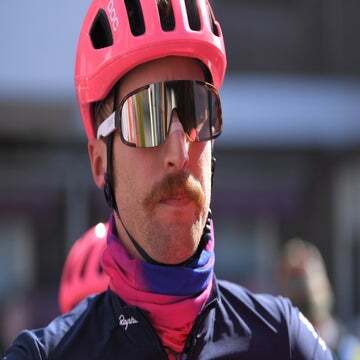 His career highlights include winning the prologue and wearing the maglia rosa at the Giro d’Italia, a silver medal in the world time trial championship, and two elite world titles on the track in the individual pursuit. Though he twice won the U23 Paris-Roubaix, victory in the elite ranks has come more slowly. In part, this reflects the difficulty of the races that suit Phinney’s talents. The monuments such as Paris-Roubaix or the Ronde van Vlaanderen tend to reward weathered experience over youthful exuberance. Phinney’s highest finish so far at Paris-Roubaix is fifteenth in 2012, which was his début appearance. 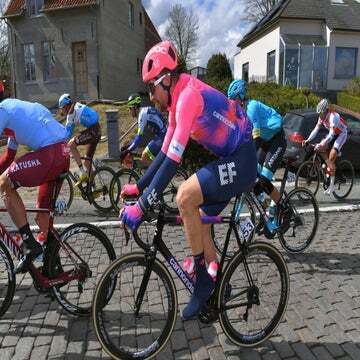 Though he has yet to better that result, Phinney’s performances at Omloop Het Nieuwsblad and Gent-Wevelgem this season suggest that he’s steadily growing into his talent in the classics. Phinney’s trajectory is not unusual, either. Fabian Cancellara won the Tour de France prologue at age 23 before eventually developing into one of the best one-day riders of his generation. And it looks as though Phinney has added a new weapon in his arsenal. The late, solo attack is the classic tactic of the time trial specialists, whose best chance to win races is a long, hard, lonely effort. Phinney won his first road stage last year at the Tour of Poland in just this way. It’s not an easy move to pull off; impeccable timing, the right terrain, and stellar legs are essential. When it works, it’s certainly memorable. 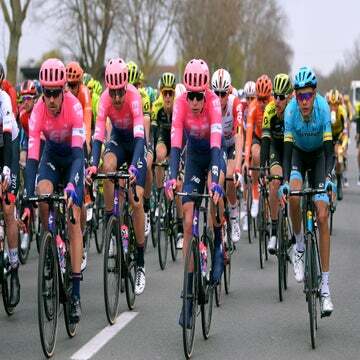 Phinney started Thursday’s stage with hopes of a high finish, and he had solid support throughout the day from his BMC Racing teammates. “I said I wanted to do well today, and they really helped me — Larry Warbasse, Greg Van Avermaet, and Thor Hushovd, especially.” Though he worried about the climb and the effects of the heat, which hit close to 105 degrees, Phinney drew confidence from his team’s support. Phinney had circled Thursday’s stage as a target, but he had never really intended to shoot for the stars. In fact, he had planned to wait until around four or five kilometers to go before making his move. But on the stage’s final climb, Phinney saw that sprinters Mark Cavendish and John Degenkolb had been dropped. Their absence meant two fewer teams to contribute to the chase, which improved his chances. Phinney also knew the long descent into Santa Barbara suited him, because he frequently trains in the area. The descent down San Marcos Pass is smooth, wide, and high-speed. There are no tricky corners —the road was built to replace a far steeper road that follows an old stagecoach route down the coastal mountains above the city. Get aero and stay off the brakes is the name of the game. Even as the gap stretched out on the descent, to about 30 seconds, Phinney didn’t think he would make it to the finish. “I wasn’t convinced it was a very smart move,” he said. But once committed, he never looked back, not until he was inside the final kilometer. Now he’s hoping it’s the second in a long series of victories to come, perhaps eventually, in some of the sport’s biggest races. But Phinney isn’t in a hurry. He’s willing to savor each magic moment that comes his way.